One of the notable things about the Victoria line is just how busy it is. Unlike other lines (except the trivial Waterloo and City) there are just no quiet stretches. Although Blackhorse Road and Pimlico may be regarded as relatively lightly-used, this is only by Victoria line standards. There are no truly quiet stations on the line. It is quite surprising, therefore, that if you know where to look you can find a platform on the Victoria line that has an eerie silence and an almost sinister lack of people waiting for the next train – for most of the time, at least. That Platform is at Seven Sisters. If the mass of quirky underground statistics included one for the blandest platform, then surely platform 4 at Seven Sisters would be it. Note the almost total lack of adverts unlike other platforms. Note also a complete lack of people despite being on the busiest (in terms of most densely used) line – which is probably the reason for the lack of adverts. The clue for this surprising lack of people is given by one of the very few signs facing a potential waiting passenger. It’s a statement that, if taken literally, is clearly nonsense. In fact trains depart from this platform about every ten minutes and even more frequently in the peak. 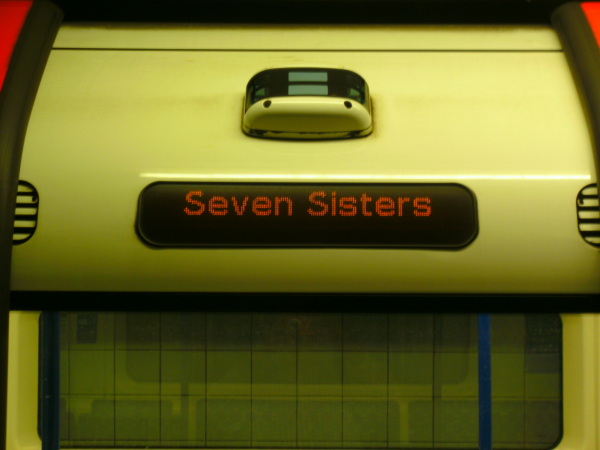 We do hope you will continue reading though for, as far as Underground stations go, Seven Sisters is actually one of the most interesting. Most people tend to think of Victoria (or possibly Oxford Circus) as the hub of the Victoria line, but in operational terms the really important station is Seven Sisters. Victoria is just an ordinary station – albeit a very busy one – with a couple of sidings that can be used in an emergency. Brixton is a very busy terminus but there is nothing particularly special about it. Seven Sisters is important and different. Seven Sisters is a rare example of a deep-level tube station with three platforms on one line. Until the Jubilee line opened, it shared this feature with Baker Street on the Bakerloo line. Since the Jubilee Line Extension opened it has shared this distinction with North Greenwich. North Greenwich is visually distinct from Seven Sisters, however, as it was built as a concrete box and not by deep-bore tunnelling. 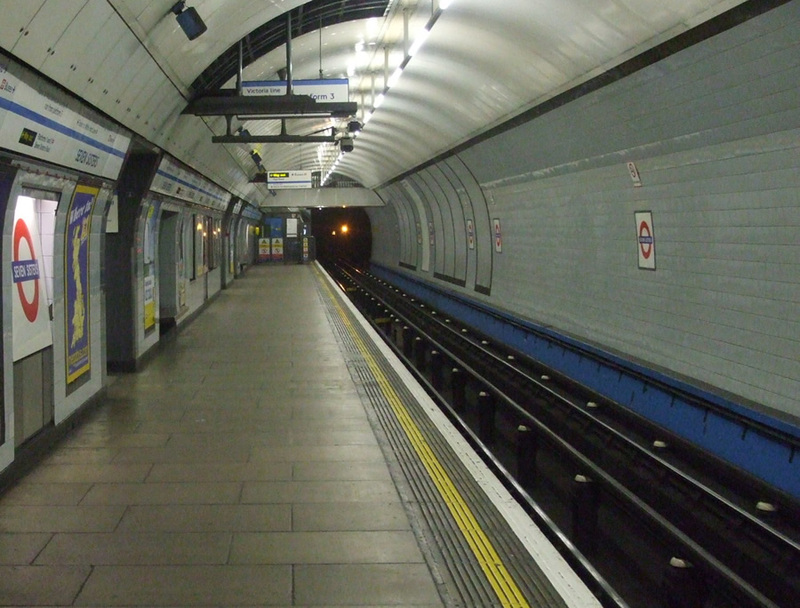 There are stations with more than three platforms of course – Camden Town, Euston and Kennington on the Northern line all have four, but in each case they are on two distinct branches. 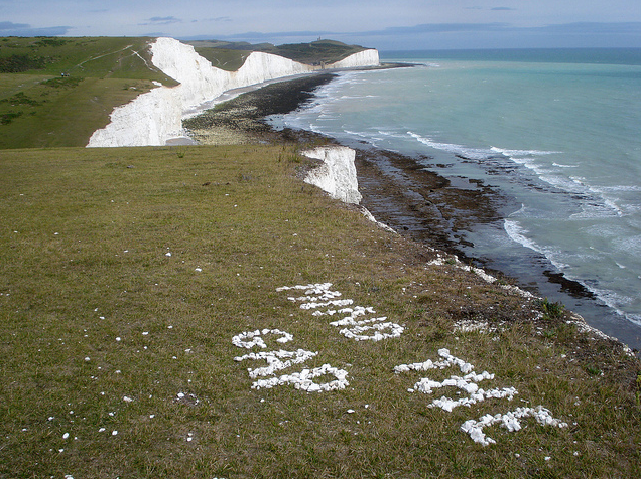 Seven Sisters is thus just a little bit special. 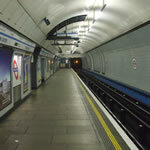 The three platforms at Seven Sisters are just one of the features of the Victoria line which reflect the considerable thought that went into the design of the line to give it maximum operational convenience and flexibility. Numerically, the platforms in question are 3, 4 and 5 (the National Rail station on top having claimed the first two ordinal numbers). Platform 3 is the northbound platform and platform 5 is the southbound one. Adjacent to platform 3 and accessible to it by cross-passages is platform 4. Platform 4 possesses some unusual touches. Although at first glance it looks like an ordinary platform (the previously identified lack of advertising aside), it also features something that originally could not be found on any other Victoria line platform. At the western end (and visible in the photo above) is a pedestrian overbridge cut into circular cross-section of the platform tunnel. This was avoided at other stations for aesthetic reasons. With no-one likely to be waiting here on the platform, avoiding it was obviously seen as an unnecessary luxury here. If visiting, note the glare of the red signal located in the tunnel at the west end of the platform. This is a Fixed Red Light which means that trains never depart in this direction. If you do linger on platform 4, then you will probably be approached by staff who presume that you are lost and need assistance. Indeed this platform must be about the only place on the underground where the staff are actually less likely to approach and ask you questions if you are holding a camera in your hand. Above is a diagram showing the relevant tracks. The little wings on the lines to and from the depot are simply points designed to derail any train that is heading for the “main line” without authorisation. Thanks to swirlythingy for providing this. Why does this platform 4 exist? Firstly it enables trains to terminate there. As can be seen from the diagram, trains can advance to either line to the depot and return from there to platform 5. Because of the intense frequency of the Victoria line it would be impractical to terminate trains at Seven Sisters with just two platforms. This was true at the time the Victoria line was designed, but it is even more true now that there are strict rules that require trains to be checked to ensure there are no passengers still on board. 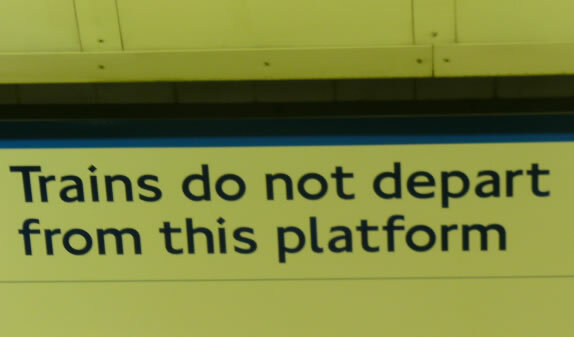 These rules have been slightly relaxed now (but not yet for the Victoria line stock), but it would be particularly undesirable for unauthorised passengers to be allowed to enter the depot. As a result, they would probably still need to be implemented at Seven Sisters. Terminating trains here has two benefits. Firstly, it cuts down unnecessary running to the terminus at Walthamstow Central on the section of the line that is slightly quieter than the rest of it. Secondly, without it all northbound trains would have to terminate at the two platforms at Walthamstow. Operationally, with the incredibly frequency of trains run, this would be highly undesirable. Indeed the line is currently constrained by the need to terminate all trains at the southern end at Brixton. Terminating all trains at Brixton was not the original intention – as discussed in A Brief History of Sidings – but this is now the case and Brixton is thus reputed to be the busiest underground two platform terminus in the world. There is another reason for platform 4. That is because the depot is actually located at Northumberland Park, about a mile north-east of Seven Sisters station. This was probably the one inconvenient feature the planners could not avoid. With just one northbound platform it would have been awkward to check the train was empty before going to the depot. So an extra platform with a tunnel leading from the end of the platform to the depot, is an ideal flexible arrangement. The tunnels leading to the depot can thus also double as sidings for trains terminating at Seven Sisters before continuing back to Brixton as described above (although this would obviously block the route either to or from the sidings). A further consideration is that it is very awkward for staff to get to Northumberland Park depot from Seven Sisters at ground level. Platform 4 makes it possible to provide a staff train. Indeed this is timetabled to run every twenty minutes except during peak periods. This doesn’t mean the platform only deals with three trains an hour. Typically every alternate off-peak train that terminates at Seven Sisters returns to Brixton, and during peak hours one train has scarcely been checked for passengers and departed before the next one is approaching. If you were able to stay on a train to the Depot then this is where you would end up. Staff trains from the depot run straight into platform 5 and enter passenger service there. The only thing that identifies that a train originated at Northumberland Park Staff Platform is that the outside is clean and still wet from going through the washer on departing from the staff halt. As soon as people get to know of a piece of railway infrastructure in London that does not carry fare-paying passengers, there is the inevitable suggestion that it could be put into use for the public by some means or other. The twin tunnels leading to the depot are no exception and at first sight would seem to be ideal for providing a service to Northumberland Park. In particular this is supported by Tottenham Hotspur football club and their fans. Sadly, such a thing will likely not happen for a number of reasons. Firstly, there simply isn’t the space in the depot to build a station – even ignoring the fact that the depot is not ideally situated. As an alternative it has, in the past, thus been proposed to build a station alongside the existing mainline railway. There is indeed space, but there are plans to reinstate four tracks here so that is a non-starter too. Current philosophy is also that Underground lines with an intensive service should be kept simple and branches should be avoided if at all possible. On top of all this, the cost would be well over £50 million – money that could probably be better spent elsewhere. It would not simply be a matter of improving the staff halt and providing safe walking routes, as the depot needs to be a secure place and a publicly accessible station would thus need to be physically separate. Finally, given the desolate location of the depot it is difficult to see much traffic generated other than park and ride except when Tottenham Hotspur themselves play at home. Of operational interest is a recent development to the lines to the depot. Readers will probably be aware that since the withdrawn of the original 67 stock the Victoria line shut on many weekends to commission the new signalling on a section by section basis. Following completion, a new timetable was introduced on 22nd April 2012 to take advantage of the faster trains. By speeding them up a 33 trains per hour (tph) timetable was introduced and replaced the 30tph one that was based on the now-scrapped 67 stock. Amazingly this was done without any publicity and the only indication on the TfL website indicating it had taken place was a minor change to the first and last times to take into account the faster journeys. The date of commencement of these times featured as a small footnote. Assuming we are correct, and that the Victoria line now regularly runs 33tph, then it appears a decision not to publicise has been made, it’s tempting to wonder whether this was to avoid adverse criticism that the Jubilee line can still “only” manage 30tph despite many weekend closures. Given that the line had been resignalled by the end of April, a few eyebrows were raised at its closure again over the May Bank holiday. This was in fact intended to make both lines to the depot fully bidirectional. We understand that in fact the work was not completed, and we await a future date for this. This will probably involve a future closure but with the Olympics and closure dates normally planned at least six months ahead we do, not expect to see this any time soon. Making the depot lines bidirectional has a number of advantages. The obvious one is that in the event of one track not being operational it would still be possible to get trains to and from the only depot on the line, but there are less obvious benefits. One line could, for example, be used as a test track (although it is probably a bit late for that). Another is that with the trains becoming busier earlier in the morning, it is becoming quite a challenge to get all the trains in service quickly once the service begins. Having both lines available means that two trains can independently enter service at the same time although this would involve a reversal for one of them on platform. Note that despite the “trains do not depart from this platform” notice, it is perfectly possible for a train to leave platform 4 in service and continue to Tottenham Hale and indeed this currently happens. The necessary crossover tunnel built so that trains from platform 4 can continue towards Tottenham Hale is yet another piece of admirable foresight built into the Victoria line despite the pressure at the time to cut costs. Finally, as we also discussed in A Brief History of Sidings, at times of disruption the biggest problem is getting rid of trains. On the Victoria line the best way to do this is to utilise both depot tunnels to send some trains back to the depot simultaneously from both the northbound and the southbound platforms. Despite being a generally well thought out design there is a surprise – and surely regretted – omission from the track layout in this area. What is missing is a very short link from the west end of platform 4 to join the southbound running line. Such a line would have enabled trains terminating at platform 4 to go directly to Finsbury Park without reversing in the tunnels to the depot. An additional advantage of this, which was not relevant at the time of construction, is that it would remove the need to ensure that all passengers had disembarked. It may have been extreme pressure to cut costs or a desire to ensure that everything was kept simple for passengers with all southbound trains departing from platform 5, but whatever the reason it was one of the few real oversights made during construction. There was no desperate need to commission such a link straightaway, but a failure to put the necessary bare short tunnel in place during construction was a piece of short-term thinking that is now almost impossible to rectify at any reasonable economic cost. 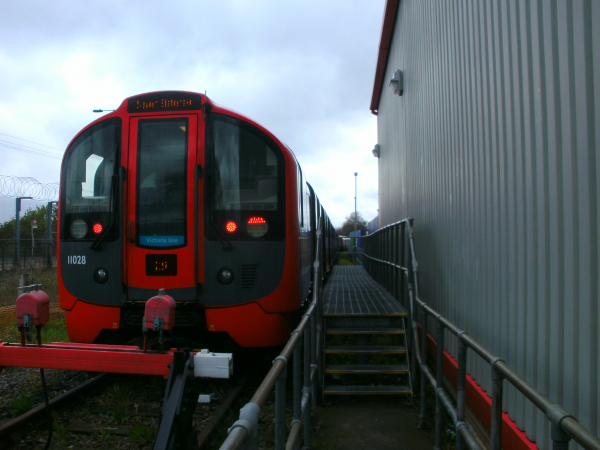 We will finish our short sojourn to Seven Sisters by looking at a quirk it almost had, rather than one it actually does – fully automated services, on entry from them depot at least. This was an opportunity that presented itself during the stock replacement and resignalling. Trains could have been run automatically without a driver or other supervisory staff between the station and the depot. Despite the fact that it is the station that is the main driver booking-on point and not the depot, this was an option that wasn’t exercised. In part this was likely because it would have pushed the current technology to the limit. It would also have meant a union confrontation for relatively little gain. Mainly, however, it was for a reason that is very familiar across the Underground network – the age of the old rolling stock meant that something needed to be done relatively quickly and there wasn’t really time to investigate some of the more far-reaching ideas. The Public Private Partnership was probably also a factor, is it discouraged risk-taking even when there was much to be gained. Now that the equipment is working reliably and effectively “under guarantee”, the mantra “if it ain’t broke don’t fix it” will almost certain (and arguably rightly) prevail for some time yet. Seems like the “rumours” of new line names and colours isn’t going to happen! @ Briantist – when you consider the hundreds / thousands of diagrams, maps, signs and visual / audible announcements that have to be changed when TfL takes on new rail services / the network changes it is inevitable that some work has to be done in advance. I used to be in charge of placing orders for all these changes and changes to rolling stock signs was always a nightmare. This was because depot staff always had something more important to do than diverting scarce resource to put up signs / overlay stickers. It was even worse with recorded messages as many trains have a capacity limit on the number of announcements they can cope with. You then have the problem of booking the person to record the amended announcement as many systems use real voices not “robot” ones. Half the trick was to make sure you kept on top of all upcoming changes – assuming the organisation itself knew and was prepared to tell you! To the public it looks like putting a sign up should be extremely easy but the reality of co-ordinating all the changes and getting them done properly is a massive task. 47 trains, 8 cars per train, up to 12 line diagrams per car. So possibly around 100 to do per train. This will also affect the central London tube map (probably 3 per car). Because this has to be fitted in with everything else – and also bear in mind that the Victoria Line, even on a Sunday, runs 27tph (32 trains in service) – I suspect realistically you can only do one train per day on average. So it is probably a good idea to get started on this around April 13th to have it all done in time or in the last few days to have sufficient to at least have enough to cover the off-peak service by the time London Overground is extended. @ PoP – well exactly. You also make the interesting point that much more intensive daily service levels create further pressures when dealing with time consuming fiddly activities like sticker placement / map replacement. That’s something that’s changed since I left LU. OK… I wasn’t really that interested in the logistics of the sticker placement. What IS interesting is that Seven Sisters has kept the National Rail symbol. Is this because of the continued running of the daily parliamentary trains via the Tottenham Curve? 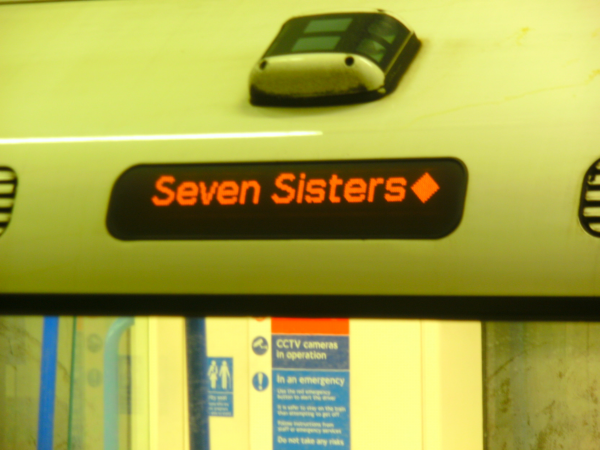 Or will Seven Sisters keep the symbol so divereted airport services will call there when there is engineering works on the other Lea Valley line? or … Is it a mistake? There seems to be a typo in the original article: “two and from the depot”. 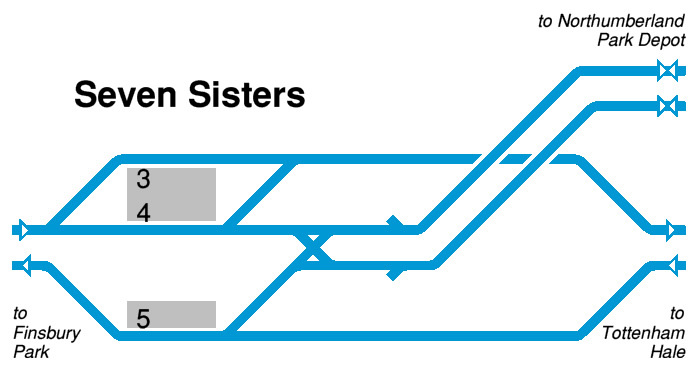 @ Briantist – Seven Sisters will have retained the NR symbol because in the peaks some semi fast Greater Anglia trains will continue to stop there (as happens today). New timetable below if you want to check. As for changes on Victorria Line the precence of the Overground symbol may increase usage as interchange of stations like Walthamstow Central and may even lead to some passengers who currently use buses to switch to trains now they are TFL Overground services . I fully agree with @WW re need for middle escalators to replace fixed stairs and fail to see how TFL can describe a line as upgraded while stations still have missing central escalators. Highbury reflects the way funding was cut when the Victoria Line was built with escalators simply built from the then BR station entrance and then subway link to old station with stairs added to the new level . I noticed that the old station entrance was painted last year it’s just a pity it can’t be used to provide step free access to platforms via old lift shafts or could it ? Regrettably (in answer to your final question) no…there are flights of stairs from the platforms up to the (erstwhile) lower lift landing level. At chatelet les halles in paris they have diagonal lifts in stair shafts. A slightly bigger problem is the fact that it will only serve the original platform pair. I’m looking at a bright red poster at Tottenham Hale showing the changes to services. Sundays it looks like half the Overground service via Seven Sisters will be all tops West Anglia. In addition there will be a 2tph Stratford to Tottenham Hale and back! My apologies, I tried to type on my tablet on the train. @ Briantist – the improvements to West Anglia services on Sundays (both Overground and Abellio operated) were announced a few weeks ago. I expect the x30 service into Stratford from Hertford East will do well once people become familiar with the new timetable. Unfortunately one of Abellio’s timetable pdfs is a bit wrong but I told them about it yesterday so hopefully that’ll get sorted. I haven’t checked all the individual timetables but the Chingford Line service looks unchanged which is fine. Let’s see how things pan out after the takeover. 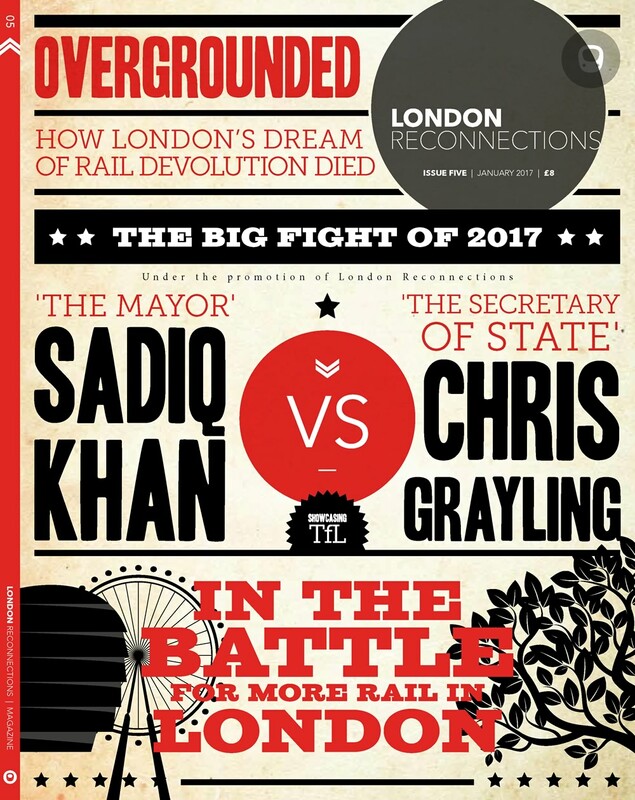 Are you saying that the new TT’s are “out” from the TOC’s ( Abellio & Overground, respectively in this case) but not from NR? @ Greg – I checked the Abellio Greater Anglia site yesterday and the full range of new timetable pdfs for their services are there. They have been decent enough to include the routes that will transfer to TfL a fortnight later. In looking at their Book 11 I spotted the n/b Sunday timetable is not formatted properly for services out of Stratford. I queried this with them on Twitter and they said it’ll be looked at. By way of a cross check the new book 14 does show the improved Sunday service to Stratford from the Cambridge / Hertford line properly. I understand TfL will load the relevant updated timetables to their site sometime soon (can’t recall where I read this). I know Network Rail haven’t loaded the new timetable yet – not sure why given we’re barely a fortnight away from the introduction date and I thought there was an industry timetable with minimum acceptable timescales for the release of public information. You are correct – there is & I think they’ve already missed the deadline. We’ll see what Monday, or more likely Tuesday brings in the way of information. @WW – I queried with Network Rail about the new timetables. Since submitting feedback in March nothing has been sent out for rechecking by sub-editors. I was told that there had been some very late changes to a services in a number of tables and that they were running under a very tight schedule to get anything out at all. Has the inclined lift at Greenford been installed yet? By using the National Rail “personal timetable” option to calculate one for mid-June, I seem to have coaxed a Stratford-Tottenham Hale timetable out of the system. I see that TfL have published new timetables for the existing Overground network but not (yet) for the transferring services. Oddly the line maps for each route have been tweaked but not very consistently. Walthamstow Queens Road recognises the existence of the Chingford line as an Overground interchange and Wanstead Park recognises Forest Gate as a TfL Rail interchange. Hackney Central shows an interchange to Overground at Hackney Downs. Bizarrely South Tottenham is still not recognised as an interchange option with Seven Sisters for the tube or Overground / AGA despite it being an OSI and with a shorter walk than at Queens Rd / WWCS! Even more oddly the NLL timetable does not recognise TfL Rail at Stratford. I’m sure there are guidelines for all this but it looks ridiculously inconsistent (to me anyway). As the recent postings have been about timetables and appear to have got away with not mentioning Seven Sisters, I am also going to try, as a problem with the tfl journey planner has been bothering me. Exact quarter hours have to be selected and the system gives one train prior and two after that time. However, the “Later” button does not give the next three trains but skips forward to the next quarter hour. On a high frequency line, several trains cannot be displayed. Another gripe is that tfl does not appear to have an enquiry service dedicated to journey planner problems. You are looking in the wrong place. If you want a timetable from a particular station on TfL you have to select Timetables. The easiest way to do this is to select More from the options at the top then Timetables in the left hand column which is headed Travel Information. Once there Select “Tube, DLR and Overground. Then select Victoria Line or whichever line you want. Select departing station (e.g. Seven Sisters) and arriving station and you are done. Every single train from first to last is listed. Note this is timetables not live departures so does not necessarily reflect the service actually running. No I don’t want a timetable, just to plan a journey at a particular time. For example, want to leave at 1025. Five trains not shown around the time I want. @ Anonyminibus – the only suggestion I can make about giving some feedback on the Journey Planner is via the TfL Digital Blog. There are various articles there about the website, Journey Planner etc. The TfL IM people do read the comments under the articles so it may be a way for you to get your point across about the banded time intervals for journey planning. If I was to quibble very slightly with you I’m not sure I see your concern when you are dealing with high frequency services that run every few mins. I do understand the point you’ve made but it’s unlikely a journey plan would be too much “off kilter” with high frequency services. It’s low frequency connections that are more problematic. And, of course, the last thing TfL are doing is, err … actually displaying a real timetable, certainly for the tubes, at any rate – most annoying. NR actually publish dates by which timetables should be available. BLAST – their site has crashed again ..
Network Rail / Timetables / Electronic TT / Schedule of publications ( or something very similar to last ) – you’ll see that the schedule hasn’t so much slipped, as fallen off a cliff. As you can see, something has gorn seriously worng …. @ Greg Tingey. I have a copy of the schedule, which is why I was chasing Network Rail about the lack of anything incorporating sub-editors initial feedback. I have been told that all initial feedback has been incorporated. However, it will be interesting to see the result for one table where there is currently no through service. Both operators had been included in one direction but only one in the other. I suggested that a decision needed to be made as to whether only one operator is shown (as it would have been if there was a through service) or both (in which case the table becomes unwieldy if they are to show all trains). We don’t have long now to see what transpires. I suspect that there may be revisions to the online copy as time goes by, but those who like a paper edition may get rather frustrated by its lack of accuracy, but we shall see. @ Greg – if you’re going to moan then please do so on the basis of facts. You can bring up the time of every tube departure at every station on the TfL website. Further all of the tube working timetables (including future ones starting on 17 May) are also available on their website. This is vastly better than it previously was. And before you moan about the TfL website design one easy Google search brings up a link to the working timetables. If we were discussing bus timetables then I might be inclined to agree with you that the information is partial and not terribly helpful. I understand, though, that TfL are working to publish all of the detailed bus schedules on line. This is because they are regularly requested via FOI and thus it’s easy just to publish and allow free access rather than tie up the FOI team resources. The only issue is that the publication process is taking months longer than initially promised and there’s been no online explanation as to why. No Sunday service on the Rominster! Or Saturday after 8pm. @ Anon 1247 – interesting that the timetables for Overground are up but not TfL Rail (yet). TfL have said they are looking to improve the Rominster service but it’ll be either December this year or in 2016. It takes time to negotiate the revised timetable paths even on a simple route like this one. We don’t know yet what works TfL may want to do on the route or whether Crossrail works on the main line on Sundays might prevent a unit getting from Ilford to Romford to take up service. I see the Liverpool Street services are referred to as Northbound and Southbound. The Romford-Upminster services are designated Eastbound and Westbound. Romster is entirely self-contained. (If it isn’t operated “one engine in steam”, it certainly could be). If access to Ilford is really not possible on occasional Sunday mornings, the unit could be stabled in Romford station overnight. You would have to revise the drivers’ rosters of course. While these Overground maps fail to show TFL Rail at Stratford a Jubilee Line trains are starting to show this … It seems TFL need a decent proof reader to cross check maps . This use of seperate maps raises questions as to whether Overground trains should show both existing and West Anglia maps on all trains like S Stock Trains show District and Circle/ Hammersmith and City maps and if not how will passengers learn about interchange at Hackney Central and Hackney Downs once new link is open ? @ Timbeau – In terms of Rominster I was merely repeating what I’ve heard TfL / LOROL say in terms of there being a timescale to effect timetable changes. The access to / from Ilford was my speculation given early Sunday services to Shenfield are replaced by buses from May to December and possibly beyond. I think it’s a reasonable assumption that there will be ongoing engineering activity at weekends on the Shenfield Line from now until 2017 and possibly beyond to facilitate Crossrail. I think I agree with you about the West Anglia line diagram. It would be more sensible to split the Chingford route from the Cheshunt / Enfield one. As you say there is precedent for that treatment from Tube line diagrams. It is also a tad disappointing to see the AGA peak services via Seven Sisters not shown in the timetable. AGA’s timetable covers both services perfectly well so why TfL should exclude them I know not. Given there are likely to be different pass validities in the AM peak between AGA and LOROL services it would be sensible to highlight the difference but show all the trains that are running – lots of ways to do this. @ Melvyn – I think the treatment of maps and what gets posted where will evolve over time. Whatever happens for May is unlikely to be the final design – just my guess. I expect TfL will see how things go and conduct some market research to fine tune how things are presented. Is there an official map of the whole Overground network yet? Why? The 378s won’t work on WA and the 315s won’t work on the NLL/ELL etc. See page 52 of this pdf. Wouldn’t that be clearer in five different colours (or six if you include the Emerson line)? Careful choice of colours (but continuing the convention that Overground, like DLR, uses “open” lines) would be needed to minimise clashes with nearby Underground lines. Odd that a map as significant as this should appear in the middle of an enormous large print timetable. (The middle would make sense if it was printed out on A3 pages and stapled together, of course). (It is possible that it also appears in another corner of the TfL website, but no contributor here has yet spotted it!). It is clearly a work in progress, for the reasons which Ian J succinctly lists (and perhaps others). Making it polychrome as timbeau suggests, while useful, would be a bold step in the overall scheme of things. I couldn’t help noticing, on page 1 of the same pdf, a map of part of the overground network which has the two western branches swapped over. (Though accurate if viewed from the centre of the earth). IMHO a step too far from geographical logic. @ Ian J – thanks for the pointer to the updated LO map. A couple of observations. The addition of a pink reader on the Hackney Downs / Hackney Downs interchange is new as it will now be within station property boundaries and not an OSI via the street. I wonder if the OSI will be removed? The treatment of interchanges is bizarre. Walthamstow Central – Queens Road is shown as being within stations (like at Willesden Junction or Gospel Oak) when it involves a walk through the streets. You then have Seven Sisters – South Tottenham missed out completely even though it’s probably shorter than the Walthamstow link. TfL Rail seems to crop up a bit more consistently on this map than on other ones. I agree there needs to be a far better explanation of what a Pink Card Reader is. Do they only read “pink cards”? 🙂 TfL can do better than this. @ Timbeau the new link at Hackney opens up new interchange and journey possibilities which may not look new to contributors to this site but will be to many rail users . My comparison with S stock was for illustrive purposes only as a way of using limited space to show both networks . If the full Overground map could fit on trains then it should be used just like DLR show full Dlr network . Anyway the creation of the Overground should be about the creation of a network of lines and not seperate groupings of lines but more in the spirit of Chris Green Network Southeast which for the first time ever managed to produce a map of all lines in South East England and in the process built new business as people suddenly saw how easy their 2 bus and 2 train journeys could become if they changed at a different station. That map of the full Overground Network needs to be displayed at all Overground Stations and maybe even Underground Stations . And then we have the question of display of TFL Rail map for pre- Crossrail service to Shenfield from Liverpool Street where WA Overground also begins at opposite end of the station ? @Melvyn – surely a better idea would be to not cut off the Overground from the Underground or DLR and have one map with it all on? I agree entirely that the full Overground network should be displayed at all Overground stations – as it will be, because it’s on the Tube map. But there is a difference between a network map for display at stations – which should be comprehensive – and the in-car line maps which only show the stations the train can stop at. Both types appear within Tube trains. As I have already pointed out, there are three line maps displayed on S stock. A District map, on S7 stock only. An H&C/Circle map, also on S7 stock only. And a Met map, displayed only on S8 stock. No-one expects an in-car line map on S stock to show the Central Line. Why would the equivalent on a class 378 show the Chingford line? Leave that to the network map also displayed in each car (which shows the Underground as well). The DLR trains display the entire DLR network because all DLR units can work on the entire DLR network. The distinction between Underground and Overground (and maybe DLR) is irrelevant to most passengers. They do not need to know, and certainly don’t care, who employs the crews (LOROL or LU), or who owns the track, or what powers the trains. It is, or should be, just another TfL line. Showing the Chingford line on the same map as the Goblin is no more, and no less, relevant than showing the Victoria Line. And I know the 172s and 378s both use the same line map – probably because it wasn’t worth producing a separate map for just eight units.